If you love to read, there's a bitter truth to life. You'll never have enough time for all the books you want to enjoy. Current trends in publishing just make things worse, with endless multipart series and 700-page biographies hanging like ripe fruit in the garden of knowledge. When reading isn't practical, audio books have for years pitched in to help with the next best thing to the written word, but they haven't kept up with the times. Books on disc (or cassette!) just don't cut it in today's podcast- and smartphone-centric media world. Audiobooks.com ($25/month, seven-day free trial) has stepped into this fray with a Netflix-like Web-based streaming service designed to bridge the gap and bring variety and accessibility to the audio book experience. The Audiobooks.com catalog has some interesting titles, both common and obscure. It's ironic that while eBooks have flourished in the digital marketplace, audio productions have remained largely stuck in 20th century convention. With titles purchased one physical recording at a time, often sporting exorbitant price tags, the majority of the industry resembles the 1970's LP business model. Even DVD distribution seems progressive by comparison. 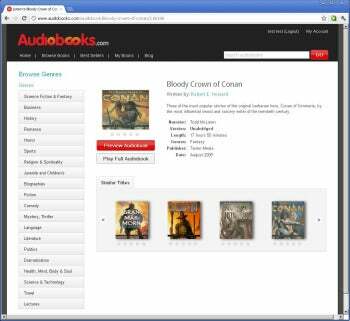 Audiobooks.com does away with à la carte pricing, using a flat fee to provide access to an online catalog of books that are instantly accessible and stream to a variety of devices, including desktop PCs, smartphones and tablets. Following the successful Netflix model, the site provides thumbnail graphics of each book's cover along with user ratings and a brief synopsis of the plot. Titles are grouped by genre, interest and suggestions based on previous selections, all with a heavy emphasis on the lighter side of popular fiction. The audio player is austere but functional, with a timeline slider, play/pause and a 30-second skip function but little else. Performance is snappy and sound playback is crisp and free of artifacts or stutter, even under low bandwidth conditions. Minor glitches in text rendering on the website seem more like growing pains than problems, but mobile site code, as tested on an Epic 4G Android 2.3 based smartphone, has more serious page layout issues that impair function on occasion, including interface elements that scroll erratically or make precise adjustments on the touchscreen difficult. Given the pace of development for the site, expect these wrinkles to be ironed out quickly, however. Streaming services live or die on the strength of the catalog they offer, and Audiobooks.com does a fair job at keeping things interesting. While popular titles and bestsellers are well-represented overall, there are plenty of omissions, some of them curious. I rarely found exact title matches for my genre queries, but I was able to find similar quality fiction and nonfiction that scratched the same itch. Rex Stout was nowhere to be found in the mystery section, but there was plenty of Agatha Christie and Arthur Conan Doyle to stand in. George R.R. Martin was similarly absent in fantasy, but Robert E. Howard was nicely represented with more than just Conan the Barbarian—in fact, with new recordings I'd never heard prior to seeing them listed here. There are also an enormous number of Star Trek books, some four dozen, in the Science Fiction section. That's a lot of Shatner! For Trek purists, this may be reason enough alone to take a look. Non-Fiction books are fairly well represented as well, with a nice cross section of histories, biographies, science books and so forth to keep you awake nights when Ian Fleming won't do. Fewer abridged titles would be appreciated, however. The biggest hurdle facing Audiobooks.com is pricing. While $25/month is cheap when measured against Audible.com's subscription-plus-payment method and other conventional audio book purchase systems, it's much more expensive than the other comparison people are bound to make, the $7.99 Netflix charges for access to its larger, flashier media catalog. And there's always the public library and Overdrive, which are free. These comparisons are only slightly unfair--the fees could use a trim and the catalog more titles--but they overlook the groundbreaking, consumer-friendly model that's beginning to be employed in a sector of the industry that hasn't enjoyed it before, which is a move worthy of support. Check out the titles on offer; they provide a free trial week of service if anything catches your eye. Audiobooks.com is an interesting experiment. With a little more polish and value, it'll be a winner. Note: The Download button takes you to the vendor's site, where you can sign up for this service. The $25 price is a monthly price. Audiobooks.com is Netflix for book lovers.